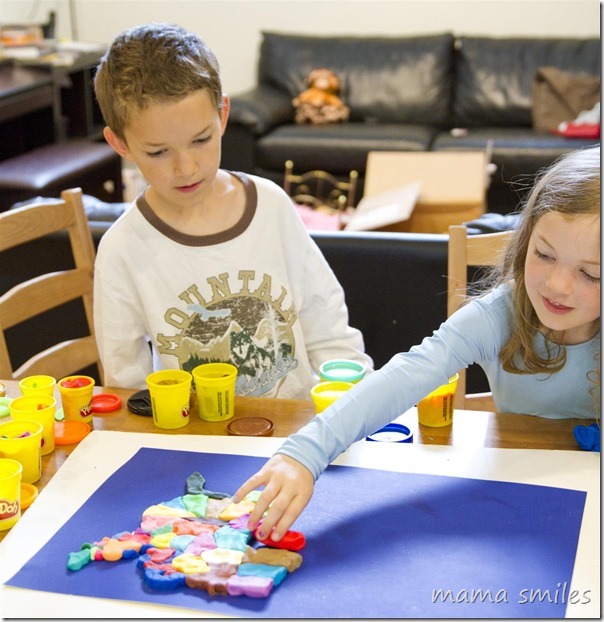 Johnny, Lily, and I worked together this weekend to make a map of The United States – out of Play-Doh! We were sent a bunch of Play-Doh by Hasbro , who challenged us to make a Play-Doh sculpt that shows our national pride. The kids have been really interested in the layout of the United States ever since our cross-country drive, and Johnny and Lily worked really hard to make this map! They were particularly interested in the states that we drove through on that trip, as well as states where we have lived and where other family members live. Johnny also adores Alaska and Hawai’i, so he was excited to make those states! We tried to get proportions right for our map, but they are far from exact. We used the book Draw the USA as our guide, and that worked pretty well! 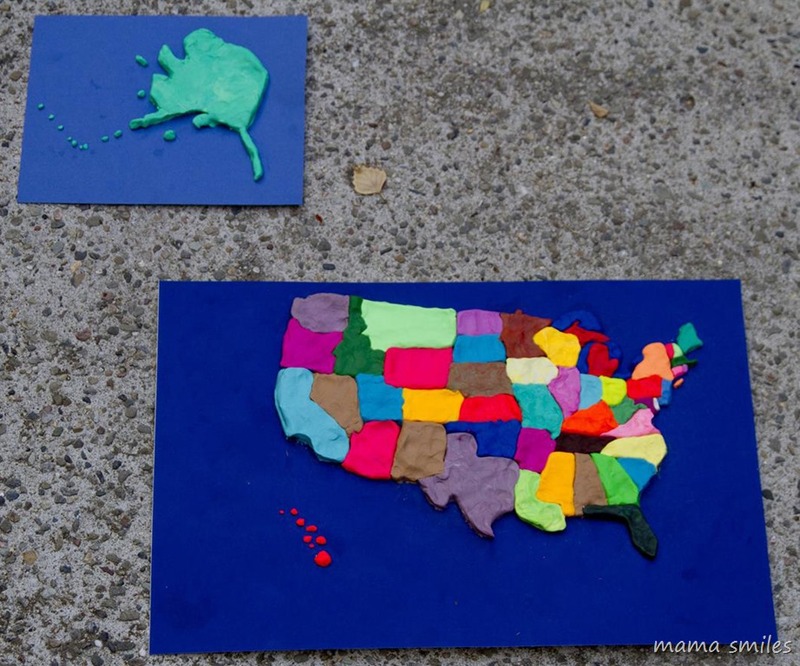 We mixed colors so that every state got its own shade of Play-Doh, but a couple of our mixes are pretty close! The kids thought it was pretty cool that you could mix a little bit of black Play-Doh in to make a color of Play-Doh darker. We made a video of the process. I had ambitions of getting a stop-motion style image of every step, but it’s just too chaotic when you are working with a seven-year-old and a six-year-old with a three-year-old helping. This was a BIG project, but we think the end result is pretty cool! When I was studying for my teaching credential, I learned that the more ways you learn something, the better it sticks. I definitely have a better understanding of the makeup of our country after putting this map together with my kids – even though we have done several puzzles of the United States! I think this would be a fun exercise for an AP US History class – you are never too old to play with, and learn with, Play-Doh! What would you like to sculpt out of Play-Doh with your kids? I love this activity. It has so many skills involved and it looks so fun. The map turned out great! That’s amazing! I hope my kids have the attention span for that some day. It’s hard to imagine they will. Your kids are impressive! I love the film. The music you picked is great – and what a terrific job they did on the map! Thank you! This was a BIG project, but they had fun with it and I was impressed by their perseverance! What an awesome project!! It turned out great. Add in the Scrambled States game to really get the States and the State capitals to sink in! Then, your kids will be all set for 4th grade when it’s on the Common Core Curriculum. And when they know most the states already, it’s a lot easier to study for the tests! I love this! 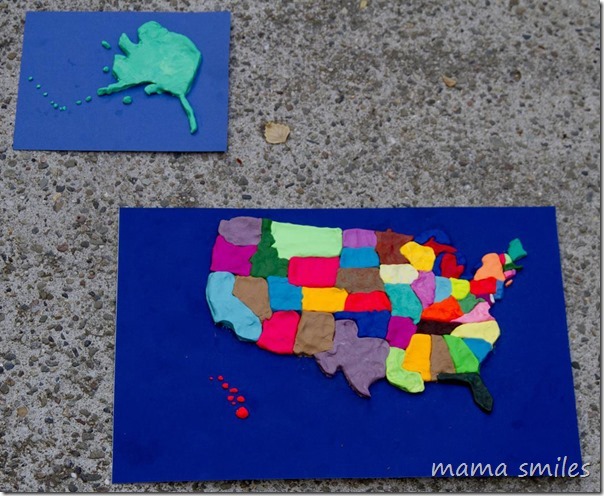 I can’t imagine my kids being patient enough to do all of the little bitty states, but I still love this activity. Driving cross country certainly seems to be helping my kids’ understanding of geography, as we drove back yesterday and crossed into Oklahoma one of the boys said, “Oklahoma, also known as the last state before we get to Texas!” I was cracking up with that one. Wow. This is amazing! Well done!